Spoiler Alert: Be prepared for the onslaught of chicken dishes! When the fall season hits, I can’t think of anything better than busting out the Crock Pot and making dishes that assault your sense of smell when you return from work that day. Also, the house just feels warmer and more inviting that way. Trust me, there’s nothing better than after a long day of being on the phone with an insurance company to argue a client’s claim, to walk in and smell the love that your dish has been making while you were away. It’s a calming force. So before I wax poetic on slow cooking, let’s get back to the topic. Namely, Chicken Noodle Soup. I know we all have a recipe that we follow. We all have our own tricks and tips that personalize how we create this cold-weather classic. And so I want to share a few of my own, as there are a few helpful suggestions to guarantee positive results. 1) Make sure to flavor your broth! 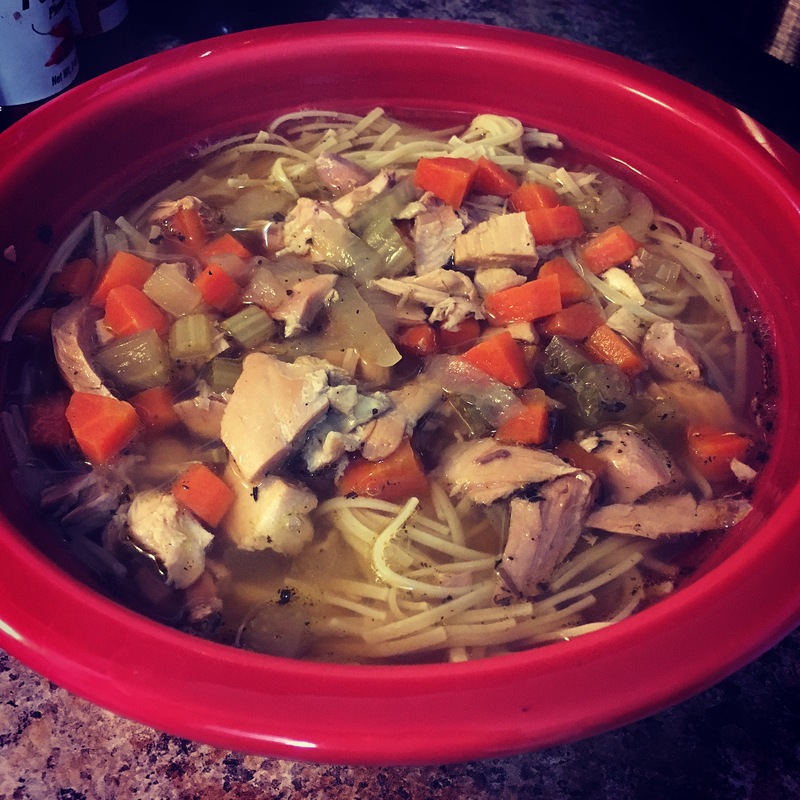 When you’re sick, Chicken Noodle is simply the best soup (in my opinion) that can bring you out of that non-hunger phase and nourish your soul. It has the protein from the chicken, the vitamins from the vegetables, the noodles to help fill you up, and most importantly: that nice salty broth to break through your temporarily altered taste buds. So while I love adding a healthy dose of poultry seasoning, don’t forget salt and pepper! There’s nothing worse than all those delicious elements in a bland broth. And taste as you go….I cannot stress that enough. 2) If you can, make your own stock. You can always buy chicken broth if you’re in a pinch, but I love making my own stock. When Matt & I purchase a whole chicken, we first roast it and eat the breast for dinner that night. Then, strip the meat off the chicken down to the bones, as the meat will be perfect for soup when you process and chop it. And in the Crock Pot, put that carcass in with enough water to cover the top of the bones, then lid on low and slow for 8-9 hours (and sometimes longer). Once the carcass starts to fall apart in the stock, that’s a good sign. When done, remove the bones and my final move is to place a paper towel in the strainer and ladle in broth through that into a container. The stock will retain some fat, but this helps keep bone fragments out of your broth. Use a wooden spoon to push around the liquid to get it to strain. You may replace the paper towels a few times as eventually the fat will pool enough to where nothing gets through, but that’s okay. This is a messy (but rewarding) process. You get a clearer broth this way. 3) Saute your veggies before you put them in and make sure they’re fresh! I keep my veggies standard: celery, onion, carrot. You can add fun ingredients like leeks or fennel, but I love the classics when it comes to chicken soup. Now, you can always just throw the veggies in raw and allow the slow cooking to do its magic, but I love getting a little bit of color on those veggies. You won’t necessarily get a bite of onion as it melts into the broth, but you will taste a hint of it. The carrots will practically melt in your mouth, as will the celery. You want to let them cook the longest in your broth. So for the best result, a little bit of oil in a pan, saute for less than 5 minutes, and add the veggies first to the broth. 4) For best results, make the noodles separately (and keep them that way). This is more a rule because Matt does not like soggy noodles. And it’s a good one! The noodles are always the final ingredient to add to the soup, because once they’re done the soup is done. And then once in the fridge, the noodles keep expanding the longer they sit. And instead of soup, you get this noodle dish with soup elements and minimal broth. So instead, I tried a new trick: I cooked the noodles alone, strained them, then placed them first in the bowl and ladled the soup over the top. When I had to clean up and put the rest in the fridge, I made a decision to keep the noodles in a separate container. You get more control over the amount of noodles you want in your bowl, and the broth remains intact when you heat it up. 5) Low and slow is the best way to go! I have forgotten the most important tip of all: the slow cooker is the best way to make Chicken Soup. Flavors are best when they have a chance to meet and meld for a while. You don’t want to rush this step and if you have the time, take it. The depth of flavor you can achieve from that low and slow technique is second to none. ← Spicy Tips: Chocolate Up Those Muffins!